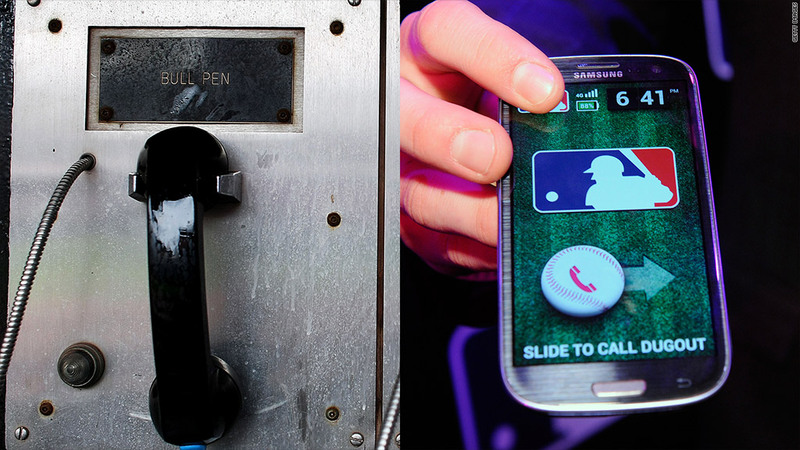 The new MLB bullpen phone (right) will replace its outdated predecessor. Major League Baseball, a sport that loves clinging to outdated traditions, is about to embrace modern technology for one of its most frequently used tools -- at least for teams with lousy pitching. The landline phones that managers pick up to summon relief pitchers will be replaced this year with cell phones. In a partnership with T-Mobile, MLB said it would install specialized wireless calling systems in "select Major League dugouts." It hasn't announced yet which stadiums will get the technology. The smartphones will sit in docks in both the home and visitors' dugouts, as well as the home and away bullpens. When a manager lifts the smartphone from the dock, it will automatically ring bullpen phone. With a swipe, the bullpen coach can answer the call. Coaches can also walk around with the phones in their pockets, if they prefer. But Major League Baseball will be "geofencing" the technology, which means that the phones can only be used in the dugout or in the bullpen. Outside those areas, the cell phones will automatically go into a locked mode so no calls can be made. That means managers can't make calls to the bullpen from the clubhouse if they've been thrown out of a game (hear that, Bobby Cox?). Other safeguards will also be put in place. A special, dedicated cell tower will be installed that only the dugout and bullpen phones can use, so fans won't be able to ring the bullpen after the manager refuses to take out a clearly gassed starting pitcher (Grady Little, we're looking at you). The dedicated cell phone tower has a second purpose: Placing a call or sending a text in a baseball stadium is just about impossible when the park is full. Put tens of thousands of people into a venue, all trying to connect to one single wireless cell site or a small handful of them, and the infrastructure quickly gets overwhelmed. A separate wireless system just for bullpen calls makes it more likely that the calls will go through. T-Mobile pledged to improve its network's performance inside stadiums. It also plans to partner with MLB to create custom baseball apps exclusively for T-Mobile customers. The National Football League has a similar deal with Verizon (VZ), whose customers have exclusive access to NFL game film and audio on their devices. The wireless bullpen phone system will first be tested during the World Baseball Classic in March by USA manager Joe Torre and his staff. Assuming the technology runs smoothly, it will be implemented for major league game use in April. Major League Baseball said the bullpen phones will be only the "first use of this technology." It promised bigger and bolder things ahead. Maybe next year, Yankees manager Joe Girardi will be able to text "Mo" to the bullpen to summon Mariano Rivera.